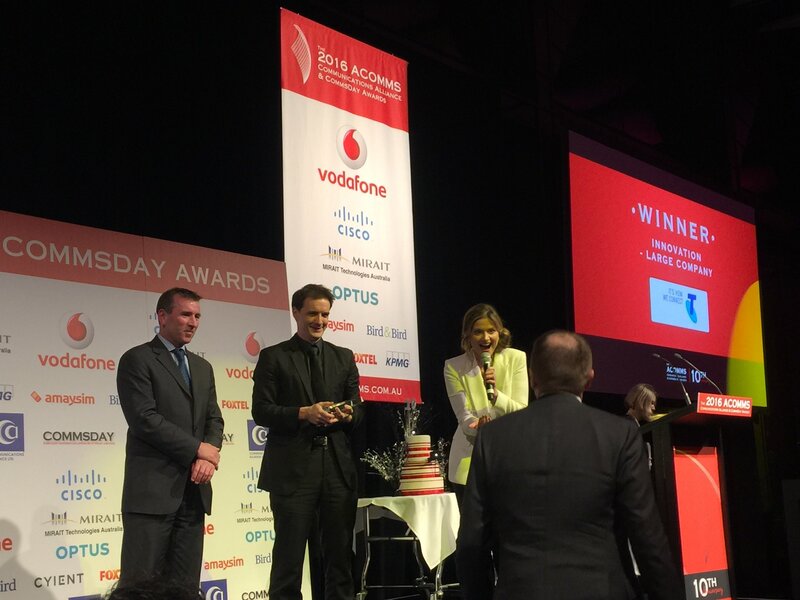 Last week at the 2016 ACOMMS Awards in Sydney, Fon’s partner Telstra was named winner of the “Innovation – Large Company” award for Telstra Air, Australia’s largest WiFi network. Telstra Air is deployed in partnership with Fon and Cisco Meraki, bringing more than 300,000 hotspots to the country and access to over 20 million Fon hotspots worldwide. Telstra Air is innovative for a number of reasons: the service sets a new benchmark for fixed broadband plans in Australia, it re-imagines the role of the public payphone by adapting infrastructure that delivers WiFi connectivity, and it uses Fon’s unique WiFi sharing technology that rapidly grows the network. People all across Australia are using and enjoying the service. Every single month, 100,000 unique users connect to Telstra Air – consuming more than 171 terabytes of data each month! In other words, that’s 2,907,000 hours of music or 85,500 hours of watching a movie. As the network continues to grow, more and more users will be able to benefit from this on-the-go WiFi experience. The Innovation Award recognises innovative communications services and products, and is designed for customers to drive industry growth. Telstra Air faced some strong competition in this category, going up against the Vodafone Foundation’s DreamLab project and the Ericsson-Telstra-Ciena fibre optic link, which makes the win an even bigger honor. Telstra and Fon are committed to delivering a world class WiFi experience to customers and we are very proud of this industry recognition. We are looking forward to the exciting year ahead, and to bringing the network to even more cities around the world. So from all of us at Fon, we would like to give a big congratulations to the entire Telstra Air team on this incredible achievement! Learn more about Fon’s partnership with Telstra and how Telstra Air works!